Even eagle-eyed commodities investors might be surprised to learn that lean hogs have been one of the best-performing individual commodities so far in 2019. 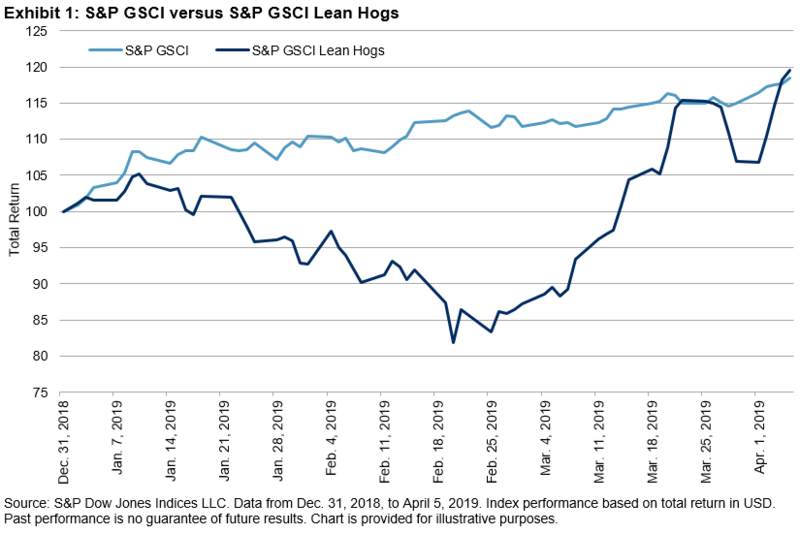 As of April 5, 2019, the S&P GSCI Lean Hogs was up an impressive 19.5% since the beginning of the year, outperforming the broad S&P GSCI (up 18.4%), and up 46% since Feb. 20, 2019. While lean hogs might seem like a trivial asset to cover in this medium, even in the relatively idiosyncratic world of commodities, it illustrates an important characteristic of individual commodity markets, namely their usefulness in expressing investment theses that are dependent on unique geopolitical, demographic, structural, weather, and health or disease factors. It also provides a timely reminder of the impact that significant price adjustments in real assets, such as commodities, have on underlying levels of economic activity, inflation, and fiscal and monetary policies. The spread of ASF risks creating a big hole in global pork supply, and the U.S. is likely best suited to fill this hole, as U.S. supplies are expected to increase, while supplies in other markets are steady or even declining. However, it is worth noting that at this time, U.S. pork producers continue to contend with a retaliatory 50% tariff in China (on top of the regular tariffs faced by all other importing countries). The tariff in China continues to make products from other countries more competitive versus the U.S., at least in the short term. Filling the disease-induced supply hole will not be straightforward. The broader implications of ASF and higher pork prices, particularly in China, are noteworthy. Pork is believed to be the single largest item in the Chinese CPI basket (official components and weights are not disclosed), and while domestic Chinese pork prices are notoriously volatile, policy makers are undoubtedly already worried about more than just the rising cost of their red-fried pork lunch. There have been no reported outbreaks of ASF in commercial hog herds in the U.S. or Western Europe, but the potential impact of an outbreak on lean hog prices in either region could prove to be momentous.